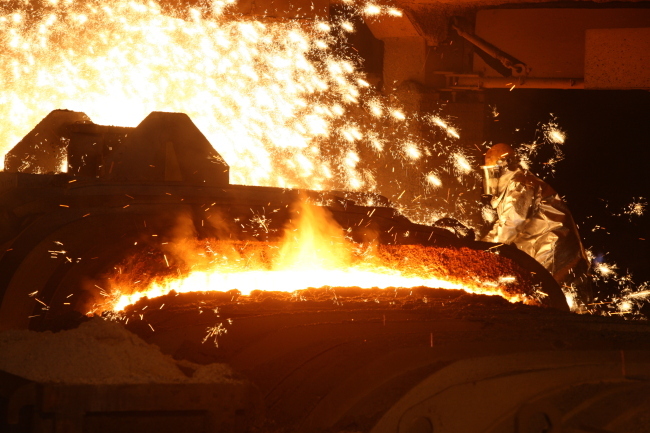 When thinking of a steel mill the typical image that comes to mind is molten metal pouring out from a blast furnace and workers sweating while maneuvering a large-scale operation inside a factory. Taking steps beyond the conventional industry, South Korean steel giant Posco is seeking a transformation itself by integrating information and communication technology, artificial intelligence and big data to its manufacturing sites. Under its corporate agenda “Smartization,” the world’s fifth largest steelmaker plans to add technologies emerging from the ‘fourth industrial revolution’ era to its non-steel segments including rechargeable battery, construction and chemical engineering. Last week, the company inked a memorandum of understanding with GE to develop a hybrid smart factory platform set to enhance production efficiency of steel mills. The platform named PosFrame+ is a combination of Posco’s smart factory platform PosFrame and GE’s smart factory solution Asset Performance Management. “Developing smart technology for facilities will serve as a momentum-triggering smart solution business in the global market,” said Posco Chairman Kwon Oh-joon at the ceremony. Wouter Van Wersch, CEO of GE’s Asia-Pacific region, Posco ICT President Choi Doo-hwan and Matthias L. Heilmann, chief digital officer of industrial service company Baker Hughes, a GE Company also attended the ceremony, the company said. Posco’s PosFrame is capable of visualizing data needed for steel mill operations while GE’s APM sends an early warning based on a failure prediction system, helping to maintain the optimal facility condition and operation rate. As the first step of the cooperation, the companies plan to deploy GE’s APM to Posco’s Pohang plant to test compatibility between the two platforms. By developing the hybrid platform, Posco expects to boost the efficiency and safety of steel factories. “Through the platform, we plan to increase the percentage of high value-added products, namely World Premium products, to 60 percent of all steel sales,” the company said in a statement. It also aims to export the platform itself. “Upon the completion of the project, Posco will become the first steelmaker in the country to operate a smart plant. The platform will be exported to bring a significant change in the manufacturing sector,” said a Posco official. In the face of growing fears over trade protectionism and the oversupply of steel products worldwide, Posco is seeking to generate more profit by increasing the sale of high-strength and premium steel products. The company has been expanding the global marketing of “giga steel,” referring to ultrahigh-tensile strength steel rated at more than 1 gigapascal. 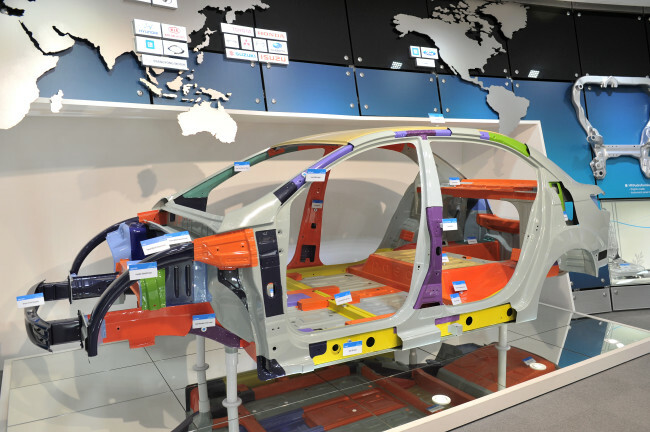 The giga steel is lighter and strong enough to endure pressure of 100 kilograms per square millimeter and has been favored by all top 15 global carmakers. The sales of World Premium products grew more than 70 percent from 10 million tons to 17.3 million tons last year. The company plans to increase the sales up to 18.9 million tons. Posco is also diversifying its business portfolio beyond steel products amid the growing electric vehicle market. To seek its potential as an EV parts supplier, Posco held a global forum last year in its global R&D center in Songdo, west of Seoul, to look for ways of developing the sector as the company’s new growth engine. From light steel to rechargeable batteries, Posco officials held an open discussion with its clients to identify what their needs are, as part of its efforts to become a “Total Solution Provider” for EVs. Not only giga steel, and high efficiency steel product for EVS Hyper No., Posco has been supplying other steel materials for EVs and lithium for rechargeable batteries. Last year, Posco started producing lithium for commercial use for the first time in South Korea. The company has completed construction of a lithium extraction plant capable of producing 2,500 tons of lithium in Gwangyang. The company plans to supply lithium carbonate to battery makers LG Chem and Samsung SDI, and to its affiliate Posco ESM, a local maker of anodes for rechargeable batteries. Korean battery makers have been relying on imported lithium so far. Posco supplying the material directly to battery makers will stabilize the supply chain, the company said, adding that it spent seven years developing the eco-friendly lithium extraction technology. The lithium extraction development has been led by Posco Chairman Kwon, an in-house researcher turned CEO. Last month, the company’s board also approved a joint venture with a Chinese company to produce anode materials and precursors for rechargeable batteries. Under the joint venture, Posco and Huayou Cobalt plan to operate a new plant in Zhejiang province in China, capable of producing 46 million tons of precursors and anode materials by year 2020. Huayou Cobalt is the world’s largest supplier of cobalt, the key ingredient for secondary batteries, producing around 50 percent of global demand for the material. The Chinese company not only owns a cobalt mine but also a nickel mine, the company said. Through the venture, Posco is expected to expand its presence in China by producing and selling anode materials there and attain a reliable supply of natural resources from its Chinese partner. Meanwhile, Huayou will be able to step into the manufacturing business through the partnership, officials said. The plans, from smart factory to lithium production, came after an intensive restructuring process that took about four years. Chairman Kwon implemented the group-wide restructuring, removing underperforming businesses, while seeking to secure a new growth engine for the company. “We believe 2017 marked the end of Posco’s four-year-long group restructuring,” said Rhee Jae-kwang, analyst at Mirae Asset, in his Jan. 29 report, adding that Posco will spend 4.2 trillion won ($3.9 billion) in 2018, an increase of 1.6 trillion won or 61.5 percent year-on-year.